The Female Metal Voices Tour 2017 is a touring mini-festival that celebrated its final night at the well-known rock & metal club 'De Verlichte Geest'. When ELYOSE take the stage at the early hour of 7pm, the venue is almost full! The band from Paris made two fine cd's so far but tonight they do not deliver to their full potential. Singer Justine Daaé has a great voice and the band are full of energy but the sound balance is overwhelmed by the drums. I'd like to see this band again sometime! Justine sings with a clear voice in French and they mix industrial sounds with metal arrangements which makes them an original band. Second on the bill are XEROSUN from Ireland. They look like four caveman and one cavewoman heading for a battle (or is it a hunt?). 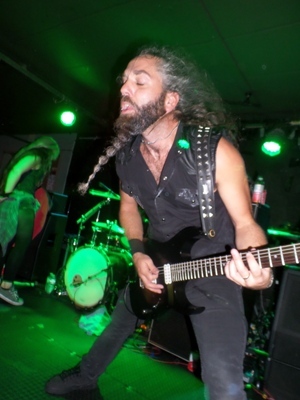 By now the place is packed and the band makes an immediate impact with their growling metal with a lot of original ideas. They label themselves as 'progressive melodic death metal' and that may be a good description. Their debut mini-cd gives a perfect idea about what this band stands for and they manage to bring this over in a live situation. 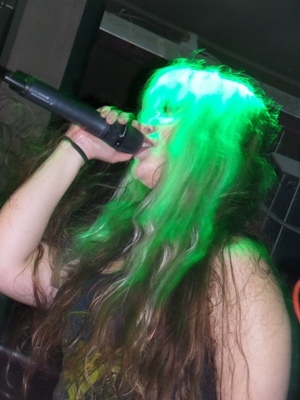 Singer Martyna Halas-Yeates combines harsh vocals with clean passages and the band never overplays and that makes a well-balanced set of an aspiring new name in the category of listenable extreme metal. THE AGONIST from Canada are a again a different matter. Singer/screamer Vicky Psarakis surely knows how to please an audience and their knife-sharp metal is much appreciated by the crowd. Fans of bands like Holy Moses or Arch Enemy will like The Agonist for sure! SIRENIA is already a household name in the female metal scene and tonight they will prove their class once more. The band fronted by Norwegian Viking Morten Veland (composer, guitar, vocals) and classically trained French singer Emmanuelle Zoldan (photo) is totally professional and Emmanuelle is a top vocalist who gracefully sings the heavenly melodies. Nevertheless, this band rocks heavily but knows perfectly how to keep a balance between intensity and gracefulness. The audience loves them very much and they are the first band of the night to get a call for an encore. Unfortunately, such things are only reserved for the headliners. THE BIRTHDAY MASSACRE from Canada prove the be a worthy headliner and with a history of almost twenty years they have much to choose from to build a good set. And they do. Singer Shibi is short but stands up against the five goth/wave man that back her up. 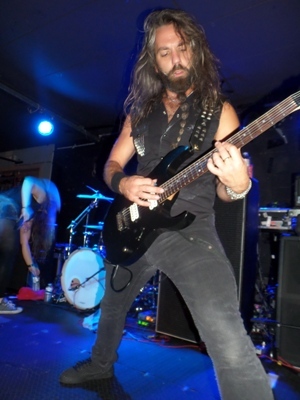 Their gothic/wave/metal sounds very energetic and danceable and is played with a lot of conviction and attitude. They are the right conclusion for a strong bill with all the bands delivering the goods and showing their respect for each other on the final night of the tour. The bill of female fronted bands was full of variation and that makes it all the more enjoyable.